Broken Axe Mountain "Poured water cannot be retrieved." "The Lanke Mountain" tells a folk story which spawned the Chinese proverb - "Poured water cannot be retrieved." In the Han dynasty (206 BC-221AD), Zhu Maichen, a scholar living in poverty at the foot of the LanKe Mountain, was pressed by his wife Cui Shi for a divorce. After much acrimonious and vituperative shouting on the part of Cui, Zhu reluctantly obliged. Once freed from her first marriage, Cui promptly remarried an odious but well-to-do carpenter. Soon afterwards, however, her second husband fell on hard times, leaving her in destitution again. At the same time, Zhu passed the government examination and was appointed governor of the province. When Zhu was making his way to the governor's mansion, Cui stopped the procession and pled with Zhu to take her back. Zhu poured a pail of water on the ground and told Cui that he would take her back if she could retrieve the poured water. She could not. So Zhu left. Cui, totally mad then, jumped into a nearby river and drowned. 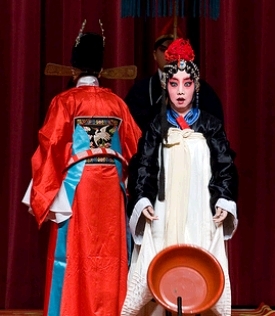 In the play, Cui, the heroine, undergoes a traumatic experience that is rarely seen in Kunqu plays. Kunqu performances are generally marked by subtlety and restraint; but the part of Cui must be acted with a total abandon. It is so unusual that a special role-type is named after it in Kunqu theater: the 'sleeves-rolled-up female role' (qiao xiu dan). Cui is a woman of such unruly emotions that throughout the play she has her long sleeves, used in Kunqu Theater to show delicate feelings, rolled up -- demonstrating her perpetually belligerent nature. Another unusual feature of the role is that actors playing Cui must use their natural vocal cords, not the traditional falsetto, in arias and recitativi, so as to reveal her unrestrained lust for wealth, fame and happiness. Cui, weary of the poor, hopeless life, keeps finding fault with her husband Zhu. Zhu puts up with her and makes peace with her once and again. Zhu ventures out in the snow to look for firewood. Hungry, shivering, and struggling with the slippery snow, he comes back empty-handed. Waiting for him at the door is his merciless wife. Cui can no longer bear the hardship. Encouraged by a matchmaker, she presses Zhu for a divorce. Finally, Zhu gives in, but he warns Cui of its irreversibility. After signing the divorce papers, Zhu passes out. Cui has some pity on him. Nevertheless, with her future on her mind, she takes her leave relentlessly. "Water Poured" takes place when Zhu arrives in town to assume his post. He is on his way to his official mansion when he comes across a waiting and delirious Cui, now eager to be his wife again. She stops the procession and pleads to Zhu to take her back. After some recriminatory exchanges, Zhu comes up with a ruse to discourage Cui's wish to reconcile. Zhu orders a subordinate to bring forth a pail of water. He tells Cui that he will have the water poured on the ground, and he would take her back only if she could retrieve the poured water. She agrees and water is poured. Naturally, she cannot retrieve the water, as she, in her delirium, thought she could. He leaves her and pushes on. Cui jumps into a nearby river in her frantic attempt to retrieve some water, and drowns.